2003 celebrates the 150th anniversary of George and Isabella’s arrival and marriage in 1853 in Melbourne, Victoria. 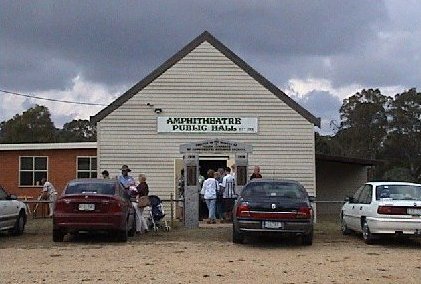 After travelling the gold diggings, and in 1863, they settled in Amphitheatre, a small town between Avoca and Ararat in western Victoria. A family reunion picnic day was held in the Public Hall, Amphitheatre on Saturday March 29, 2003, when just over 100 people came. The entrance to the Hall is marked by two pillars, with the names of those locals who enlisted for service in World War 1 and 2.